Slack is used and loved by millions of users, coming in teams of all sizes, from a only a few to multiple thousands of people. In it’s core, Slack makes collaboration more immediate and friendly. On top of that, thousands of add-ons (apps) make Slack a powerful platform for almost all your team’s needs when it comes to communication. But searching through thousands of Slack Apps and trying out the ones you might like can be tedious, so here we list 5 simple apps that are popular, easy to setup and can immediately impact your team. We’ve all witnessed a situation where everyone on the team feels bad about something, but nobody will step up and say it out loud. Whether it’s a boring meeting, a bad product idea or a new office policy. If there was a way to voice your concerns anonymously, most of the annoying stuff would be solved way before everybody starts talking about them at the water cooler. As the author of Abot says: I came up with an idea after having to participate in yet another endless company meeting. I had a feeling that everybody knew that it was a waste of our time but no one wanted to be the first to tell it. 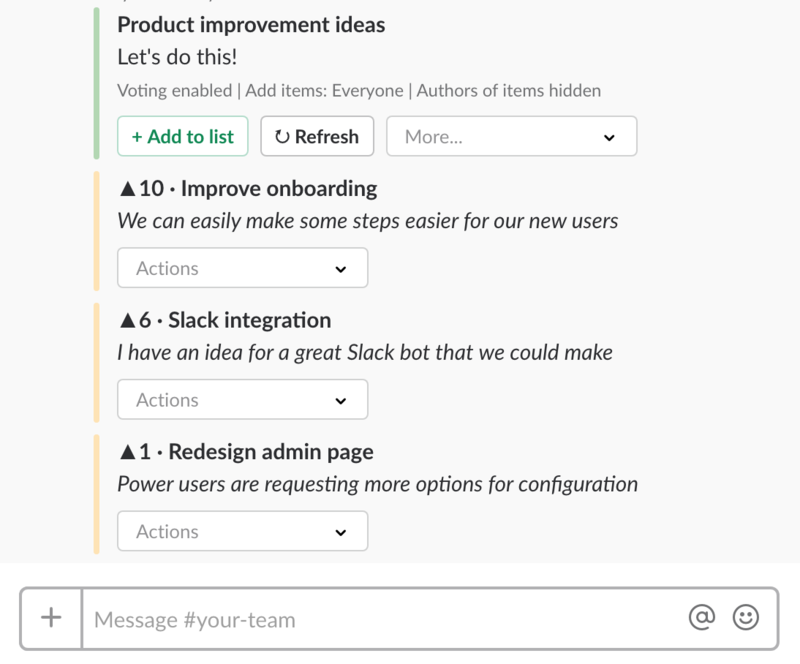 Abot promises to help by allowing you to send anonymous messages to channels and other members of your Slack team. Whoever receives a message can reply to the author without knowing who he is. If you’re lucky, you have a very diverse team. To unlock the creativity that comes from diversity it’s important to have everyone participate with their ideas and questions. Be it that you have problem to solve, need to come up with product ideas, or you’re preparing a retrospective meeting – it’s always surprising how much better the output is when more diverse viewpoints are included. Votum helps you crowdsource and vote ideas, AMA or all hands questions, meeting topics, etc. You can create lists open for suggestions and upvotes – something like your own internal Reddit. To increase participation and get more open and honest contributions, you can use the option to make the list anonymous. Your teammates will submit their proposals and upvote the ones they consider the most important. If say, you’re preparing a retrospective, your team can suggest and vote topics, and by the time the meeting comes everybody has had an opportunity to think about the agenda and you’ve made sure the most pressing issues have been surfaced. It goes similarly with product ideas, collecting anonymous feedback or any case where a team vote comes useful. 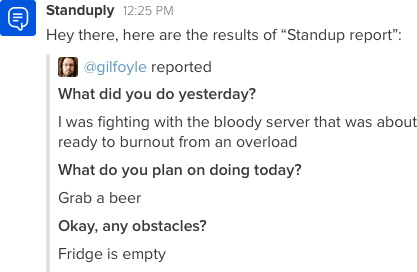 Standuply is a Slack bot that runs stand-up meetings in text format in Slack. It helps distributed teams to organize and run stand-ups and provides co-located teams with an opportunity to make their live meetings more efficient. You can set up your questions and get daily stand up reports once everyone sends in their answers. Over time Standuply grew from a simple Scrum Master bot to include a bunch of other features helping remote teams collaborate. With @must-read you can transform Slack messages into tasks, and make sure nobody misses the important announcements, tasks or reminders. If your Slack is overflown with mixed chatter, important discussions, announcements and tasks, it’s very easy to miss the important messages. @must-read helps in case you want to set a reminder or create a task either for yourself or your teammates. By mentioning @must-read together with a target username in a message, you convert that message into a must read reminder. Probably the simplest way to run a quick poll with your team. If you need a quick decision by voting between a few options, Simple poll is a good choice. However since it’s just a Slack message with a few buttons, it can get lost in a busy channel so it’s unlikely to work very well for a long running poll or something your team needs some thinking before deciding.